Britain's obesity problems could lead to a surge in new cancer cases over the next 20 years unless urgent action is taken, warns a charity. Cancer Research UK claims almost 700,000 more people could develop a form of the deadly disease by 2035 due to being overweight or obese. It is calling for a tax on sugary drinks, something which celebrity chef Jamie Oliver is also backing. Obesity is associated with 10 types of cancer, while it can also cause a range of other health problems including strokes, Type 2 diabetes and heart disease. A new report by Cancer Research UK and the UK Health Forum predicts almost three in four adults will be overweight or obese by 2035, with the rise in obesity costing the NHS an extra £2.5 billion a year. But the paper says an improvement of just 1% in the number of people going from being overweight or obese to a healthy weight every year could prevent more than 64,000 cancer cases over the next 20 years, saving the NHS as much as £300 million in 2035 alone. Surgery is a common treatment option for most types of cancer, although chemotherapy and radiotherapy are also used. Treatment helps to extend lives, meaning people with cancer can still enjoy the finer things in life. For instance, going on holiday is possible thanks to cancer travel insurance, which can cover the cost of medical expenses including the cost of replacing lost medication. 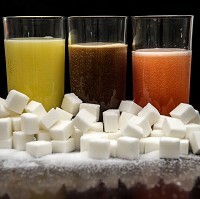 Cancer Research UK wants to see the introduction of a 20p per litre tax on sugary drinks. It is also calling for a 9pm watershed ban on TV advertising of junk food, both of which it says are needed to cut the amount of sugar consumed by adults and children. Jamie Oliver agrees with the charity. He claims food education is the key, especially for kids. The chef says Britain is raising a generation of children in a society where junk food is cheap, widely advertised and packed full of sugar, so it is difficult to teach them how to make healthy choices.